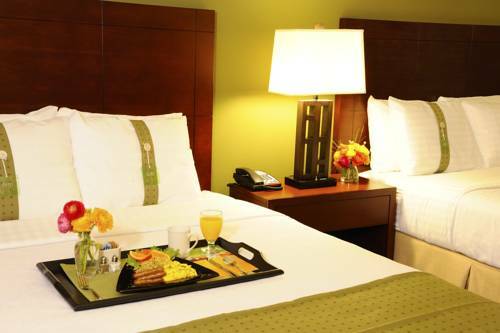 Our Richmond, VA Hotel is Closer Than You ThinkJust 10 minutes from downtown Richmond, the Holiday Inn Richmond South - Bells Road hotel is located directly off I-95, offers plenty of complimentary parking and is close to everything central Virginia has to offer. Guests enjoy the vibrant mix of history, culture and outdoor recreation in Richmond, VA.The hotel's location in Richmond, VA is ideal for those who want to experience the best of Virginia's capital without paying downtown prices. Stroll along historic Monument Avenue, visit the cafes and galleries of the Fan District and tour St. John's Church, the site of Patrick Henry's famous speech. Don't miss the unique boutiques of Carytown and whitewater rafting on the James River.When business brings you to Richmond, VA, the hotel's guests can take advantage of a 24-hour Business Center, free high-speed, wireless Internet access and 4,000 sq ft of event space for business meetings. The Greater Richmond Convention Center, state government offices, DuPont, Philip Morris/Altria Group, Inc and the Defense Supply Center of Richmond are 10 minutes from the hotel's site.After a busy day in Richmond, VA, relax in The Victor Bar & Grill, which serves breakfast, lunch and dinner in a lively atmosphere. You can keep up with your workouts with an updated Fitness Center and an outdoor pool. Book your room today; we're sure you'll love the Holiday Inn Richmond - South Bells Road hotel. The Ampthill Ballroom: Flexible, contemporary function space is suitable for meetings, social events, small tradeshows, and weddings. The ballroom is divisible into 4 separate rooms, all with individual temperature and sound control; pre-function space is also available. Salon A: Salon A is accessible from the hotel lobby and the pre-function space, directly across from restrooms. This meeting room features a built-in pull down screen and cabinet containing dry erase board, flip chart & corkboard, and has a credenza and storage. Boardroom: Boardroom with large wooden table to seat up to 10 people, flat screen TV and Whiteboard available in the room. Additional A/V and Food and Beverage may be ordered. Salon B: Salon B is accessible from the hotel lobby and the pre-function space, directly across from restrooms. This meeting room features a built-in pull down screen and cabinet containing dry erase board, flip chart & corkboard, and has a credenza and storage. Salon C: Salon C is accessible from the hotel lobby and the pre-function space, directly across from restrooms. This meeting room features a built-in pull down screen and cabinet containing dry erase board, flip chart & corkboard, and has a credenza and storage. Salon D: Salon D is accessible from the hotel lobby and the pre-function space, directly across from restrooms. This meeting room features a built-in pull down screen and cabinet containing dry erase board, flip chart & corkboard, and has a credenza and storage. CarytownLocally owned boutiques, cafes, restaurants, galleries and specialty stores in Richmond's Carytown district. This area is adjacent to the historic Fan District and Museum District. Short PumpShort Pump Town Center is Richmond, VA s premier lifestyle Center featuring and open-air mall atmosphere with plenty of unique shops and eateries. Amtrak - Main Street StationMain Street Station was built in 1901 and is one of Richmond's architectural treasures. Amtrak provides train service to the station. King's DominionThere are so many fun things to do at Virginia's premier themed amusement park! With so many things to see, you'll need more than one day to enjoy it all! Segway of RichmondOne and two-hour tours of Richmond s most beautiful and interesting sights and sounds. Guided tours complete with a how-to and safety training to ensure you experience Richmond like you never have before.